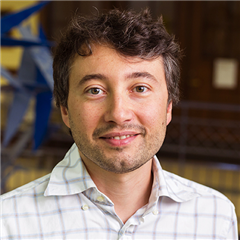 Bio: Mattia Gazzola is an Assistant Professor in the department of Mechanical and Science Engineering at the University of Illinois, Urbana-Champaign. Originally from Galliate, Italy, he obtained his B. Sc. in Energy Engineering and M. Sc. in Nuclear Engineering from the Politecnico di Milano. He then was granted a PhD. in Mechanical Engineering from ETH Zurich where he worked with Prof. Petros Koumoutsakos specializing in simulation, optimization and learning of artificial swimmers. His research interests include locomotion in fluids, where he combines theory, numerical simulations and AI to advance our understanding of the physical mechanisms involved. He is also interested in creating artificial animals – or cyborgs – to link neuro-dynamics, mechanics and complex controllable gaits-coupling sensory information to motor coordination and movement that leads to behavior. His research group develops numerical algorithms that allow the integration of AI with large scale simulations. We introduce a modeling approach based on assemblies of Cosserat rods for the simulation and characterization of arbitrary muscoloskeletal architectures. The obtained solver is coupled to evolutionary optimization techniques for the rational design of soft artificial creatures characterized by different scales and operating across environments. A control approach for these distributed mechanical systems is outlined and demonstrated in simple settings. Applications range from slithering, swimming and flying biolocomotion strategies to bio-hybrid systems. This is a joint seminar with the Applied and Interdisciplinary Mathematics seminar series. Prof. Gazzola is being hosted by Prof. Alben (Mathematics). If you would like to meet with him during his visit, please send an email to micde-events@umich.edu.